In previous two posts, I explained the way to predict impulsive five waves with 1.618 and 0.618 ratios, and the way to predict the impulsive five waves with two parallel trend lines. Everything was going well, suddenly I noticed that the accuracy of predicting the impulsive waves with two parallel trend lines is not that high. Then I started searching for another way to predict the impulsive five waves to increase the accuracy of predicting impulsive five waves with parallel trend lines. I found the nine wave counting within the impulsive five waves is a very effective technique to increase the effectiveness of predicting impulsive five waves with parallel trend lines. 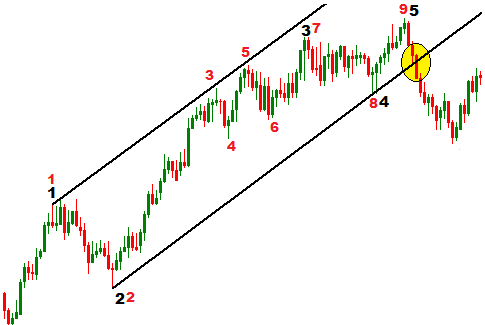 The technique of predicting impulsive five waves with parallel trend lines says that the ending point of wave-4 must be on the lower trend line in a bullish market and upper trend line in a bearish market. Read along this post to explore the way to increase the accuracy of predicting impulsive five waves with two parallel trend lines. In the above bullish market, we can see the wave-4 ending on the lower trend line, and it is the beginning of ninth wave of nine wave pattern. So, we can assume that the fifth wave of impulsive five wave pattern is the next wave. In the above bullish market, we can see the nine waves pattern appears within the impulsive five waves. 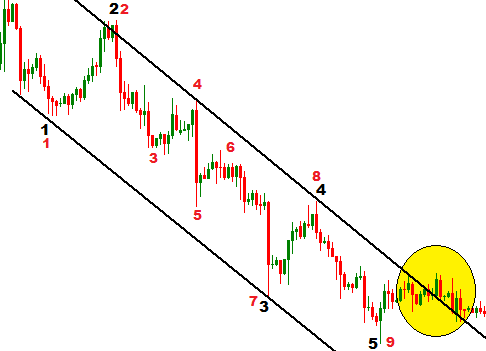 Some waves may not kiss the parallel trend lines. The degree of some waves may not be equal to the degree of original impulsive five waves. If the beginning of wave-4 of original five waves is the beginning of wave-9 of the nine wave pattern, we can assume that it is the final wave towards the direction and the trend is supposed to be reversed. Nine wave counting technique will definitely increase the effectiveness of predicting impulsive five waves with two parallel trend lines. If you want to join the discussion with other traders, you can drop a comment below. You can also subscribe yourFXguide to receive updates right into your inbox.